Home to the Arctic Blast! We decided on an early departure from Florida as it was cold and raining for the remainder of our stay. I woke up Saturday to go to the Corkscrew Wildlife Refuge in South Florida only to find it a breezy 45 degrees and a major rain storm. Staying in a hotel for 5 days and watch the rain was an option, but we decided a return trip home was in order. Here in Northwest Ohio it is now -9 degrees with a wind chill of – 35. So today is an office day and I am making some progress in updating my web site. I was able to capture of few images of Birds while on my shortened trip. This one is of a Snowy Egret. 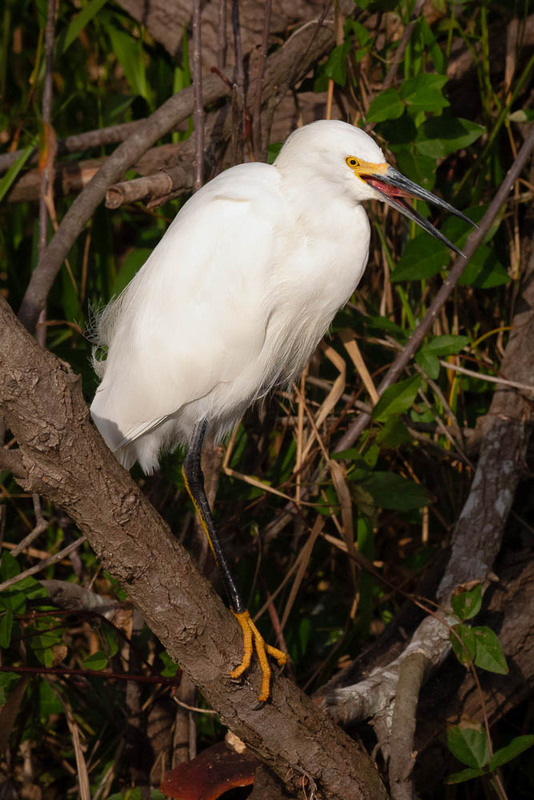 Although I did not catch him fishing along the creek bed, I was surprised when I looked at this image on my computer to see the fish in the Egrets mouth. Sometimes its better to be lucky than good. Enjoy!